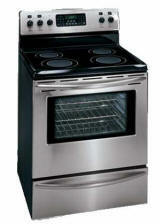 Cleaning your gas or electric stove is much easier if you took steps when you first moved into your new place. The best investment you can make is to buy a wide roll of heavy-duty aluminum foil. Remove the drip pans under the burners, and cover each with the foil before you ever use them. There are liners made for this purpose, but the aluminum foil covers much better, and cheaper to replace. Drip pans are fairly standard and cheap to replace. That will depend on how often you use the oven. On average I would say once a month should do the trick. Clean around the door and door seal area, the self-clean function will not get these areas. The oven temperature in self-clean mode gets over 800 degrees. Be sure to remove large chunks of food. They will catch on fire and create lots of smoke. After the cycle has completed and the oven has cooled, wipe out ashes with a clean wet rag. Run the self-cleaning cycle at night, when kids won't get near the hot stove and you won't notice the odor as much. Line the oven with foil once its clean. This will help the oven stay cleaner longer. Keep the foil from contacting the Bake Elements, Igniters or anything else electrical. Use Foil under the Stove Top. This is where the worst mess forms from spills and daily use. It better just to replace your old drip pans than try to clean them. The are relatively inexpensive to buy and come in pretty much standard sizes to fit most stove tops.